Actually I found this to be a fascinating development. Before the last couple of days I had never heard a flicker drumming before (though I had heard some enthusiastic grumbling about flicker wake-up calls from someone who has had a flicker around his house for the last couple of years). I decided to go outside to take a look. As I came around the corner of the house, the flicker flew from the peak of the roof into trees behind the house. Clearly, a more stealthy approach will be required if I want to catch the drummer in the act. It would be neat to at least see the drumming taking place. If the opportunity presents itself, I would also like to photograph it and record it. Later in the morning I was trying to get some things done inside but I kept hearing a fairly quiet sound like “wik-a wik-a wik-a” that was not at all familiar to me. I finally decided to go outside to see if I could figure it out. It only took a couple of minutes of careful listening to determine the sound was coming from the hemlock trees on the north end of the house. After a few minutes of watching I spotted a pair of male flickers perched near each other on the same branch with a female flicker moving around in a nearby tree. The “wik-a” calls were coming from the males (I should have known they would not be satisfied at merely interrupting my sleep; they needed to interfere with work too). The two males were within a foot or so of each other on the branch. They would turn to face each other and, as far as I could tell, both make the “wik-a” calls in a rhythmic manner as they bobbed and weaved with their heads from side to side. It seemed like a fairly well choreographed dance, but like most dance, I didn’t get it. While dancing, they would sometimes fan their tails, though it was unclear whether this was a crucial part of the dance or just to help them keep their balance. They would engage in this for a few seconds, then sit and stare at each other for a while (maybe it’s the Northern Flicker version of an Old West gunfighter showdown). Occasionally one of the males would move towards or away from the other, but it was not clear to me which one, if either, was an aggressor. Throughout all of this, the female just seemed to go about her business off to the side. It did not seem like she was paying them too much attention, but that’s hard to say for sure. Eventually, the female flew to a different tree, and the males followed her (leaving no doubt that regardless of whether the female was paying attention to them, they were definitely aware of her). They both chose the same branch in the new tree and went back to their faceoff. This time the duel was interrupted almost before it had a chance to start when the female changed trees again, and the males dutifully took their show to a new venue. They changed trees 3 times in a minute or two while I was watching (after spending at least 15 minutes in the trees where I first saw them). 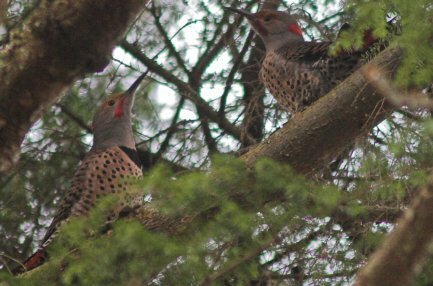 They seemed to have settled on sticking to a new tree for a little bit when I pulled myself away from the drama to go back inside to get to work (and by ‘work’ I guess I meant, ‘blogging about Northern Flickers’). One interesting thing is that one of the males had a well defined red crescent on the back of its neck. According to Sibley’s guide to birds, that is a characteristic of the yellow-shafted Northern Flickers (which tend to be in the east). Despite the red crescent, this bird clearly did not have yellow shafts on its feathers. Intermediate forms of the Northern Flicker are said to occur commonly accross the continent, so this is probably not too unusual in general. It is my understanding that this is not common here in Sitka (on the far western edge of the Northern Flicker range). Further investigation of other photos I took indicate that the other male may also have had a red nape crescent, though it was difficult to say for sure. Despite the active morning for these birds, they were not completely done for the day. Later in the afternoon I heard the “kwikwikwikwi” call from a distance on a few occasions. Sometimes it sounded pretty close to the house, other times further away. Some of that could have been due to the direction the bird was facing as it called (I did notice a dramatic change in the volume that happened too quickly to have been due to a change in distance). We’ve recently had a northern flicker drumming on the metal chimney cap of our bedroom fireplace, at around 6:30 a.m. Way too early for us, too. The sound reverberates down the chimney, startling our cats and waking us up. My husband has caught him at it, but without camera in hand. This morning at around 8 a.m., I saw the flicker on our neighbor’s chimney cap. I wish he’d wait until that time to visit us! Great photo. I watched some flickers drumming today, but I didn;t get a photo either. I seem to have caught it more his year than in previously years. Maybe I am just more attentive. Thanks for sharing. My wife and I had just sat down for an early evening meal, around 3:30 pm on Monday, Jan. 1, 2007, when she spotted an unfamiliar bird on one of our suet feeders in our backyard. We immediately got the bird identification books out and decided it was a Northern Flicker. We have never seen this bird previously and we quite “taken” with all it’s markings. It fed for a short time on a suet feeder and then flew into a nearby tree right before it flew into the woods that edges our backyard. We live in Terre Haute, Indiana, and I guess they would be common to the area, but we have never seen one before. We are having a very mild winter and I am not sure if they stay every winter or just happen to have stayed this year. Any information from anyone out there? Thanks!!! so lucky to have them in back yard. i had never seen them here before. This is a new one to me. I have been a casual birdwatcher for over fifty years, and although I know Flickers are not too distantly related to wood peckers had never thought they were drummers. And I live in a Flicker populous area. Until this morning, when I thought my neighbour must have rented a jack hammer. But why did the noise seem to come from above me, still wrapped up in the blankets? Reluctantly stirring myself I went outside, and the noise stopped. No sign of a project next door. Sitting down to breakfast, puzzle still unsolved, I was interrupted by an unbeleivable staccato on the top of the aluminum porch roof just outside the sliding nook door. Uotside again, rapped on the underide of the roof and the culprit flew off to perch in the top of a fir tree. A very definite mail flicker. Hopefully he wakes someone else tomorrow.